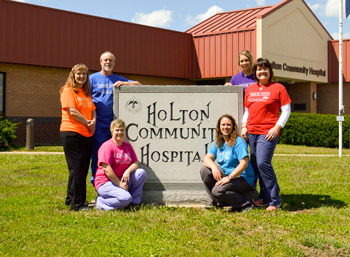 The Holton Community Hospital Radiology Team is comprised of board certified Radiologic Technologists (RT) through the Kansas State Board of Healing Arts and the American Registry of Radiologic Technologists. Several team members are specialized in multiple imaging modalities and hold certifications in specialty areas such as Mammography, CT, and Sonography. Our mammography program is accredited by the American College of Radiology (ACR) and in compliance with FDA standards. The team provides service by appointment Monday through Friday from 7 a.m. til 5 p.m. and most evenings. Our team understands that your health needs are not always predictable; therefore, an on-call technologist is readily available 24/7 for emergent imaging coverage during non-business hours. Image interpretation is provided by a board certified Radiologist or Cardiologist. All results fax directly to the requesting provider. To fulfill our organizational pledge to provide Quality Healthcare Close to Home, we offer a wide variety of imaging services. Those services include X-ray, Fluoroscopy, Computed Tomography (CT), Ultrasound/Sonography, Echocardiography, Digital Mammography, mobile Nuclear Medicine (weekly), mobile MRI (twice weekly). Our department is an accredited site for the Washburn University School of Radiology. Washburn University students are routinely onsite working side-by-side with staff technologists to complete clinical competencies and gain rural healthcare experience. As technology continues to advance, so does the equipment in the imaging world. In an endeavor to offer advanced technology to our community, Holton Community Hospital upgraded to digital mammography in 2014. The improved technology delivers a significantly lower dose of radiation to the patient when compared to conventional film mammography. Our FDA approved full-field digital Fuji mammography system captures optimal image contrast for all breast types, even dense breasts and implants. We just replaced our CT system with a new, dose-reducing Toshiba CT solution. We strive to provide technology that produces high quality, diagnostic exams at the lowest level of patient radiation. Please click here for information regarding our pricing for commonly performed tests.